Monday Morning Art: The Champ! IWA East Coast crowned a new Heavyweight Champion October 3 at “Skate Or Die 2” in Campbell’s Creek. Trik Nasty defeated El Drunko in a shocker. 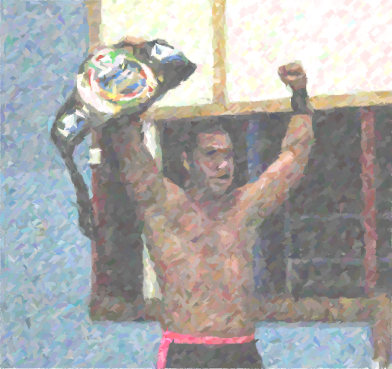 I snapped a photo of the new champion as he held his championship belt aloft, and then I used that as the basis for this digital painting, somewhat in the style of Leroy Neiman, but not as sloppy. You can order the DVD of “Skate Or Die 2” right here, so you can watch this thrilling match. You can also see Trik Nasty in action this coming Saturday in Nitro, on the ASW card that also features The New Age Outlaws of WWF fame, and WCW’s Daffney. Follow the link for more details.